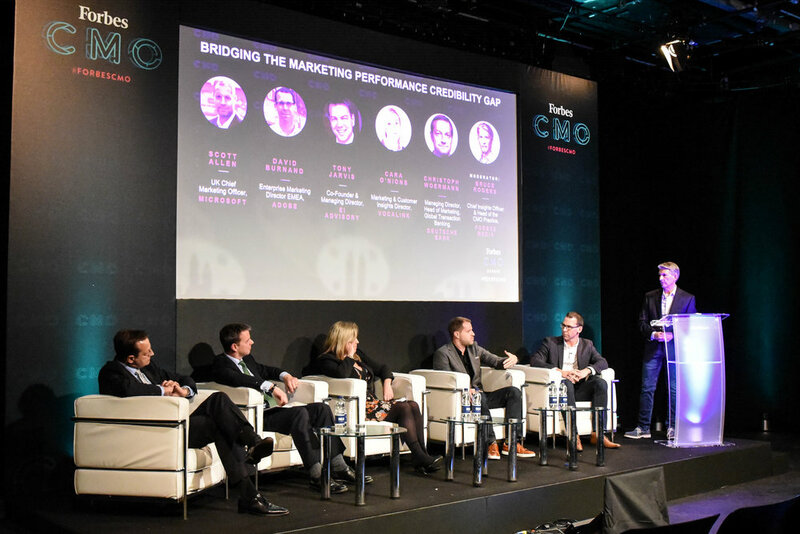 Convening an eminent selection of CMOs from across the industry, EI Advisory was invited to take part in the inaugural Forbes CMO Summit Europe on Tuesday 14th November, (see previous report here, covering the whole summit) hosted at The Hospital Club in London. Tony Jarvis, Co-Founder & Managing Director at EI Advisory participated in an impressive panel on building credibility as a marketer, alongside Scott Allen, UK CMO at Microsoft, David Burnand, Enterprise Marketing Director EMEA at Adobe, Cara O’Nions, Marketing & Customer Insight Director at Vocalink, Christoph Woermann, MD, Head of Marketing, Global Transaction Banking at Deutsche Bank, and with moderator, Bruce Rogers, Chief Insights Officer & Head of CMO Practice at Forbes Media. Setting the backdrop with the view that marketing is seen as a cost-centre at board level, Bruce opened the floor to this insightful discussion and here are the key themes from the session, to help you turn this preconception around. For Cara, this is a topic with personal relevance, who was in the past faced with the challenge of being seen as “the colouring-in department.” She shared her strategy to tackle this swiftly, which centres around applying three different values that you can reflect back to the business: “people, process and tech.” Finding a place or having a voice at the top table, and speaking the right language to the business is crucial when it comes to process. Of course, it is also critical to embed yourself in the numbers and the business, to demonstrate the power of marketing. Similarly, Christoph stressed the importance of “approaching marketing as a banker first.” For a marketer in the banking industry, this is the ability to report back to the business at every stage with clear, precise vision, backed up with numbers, thus developing credibility. Tony advocates building credibility with the business by creating marketing plans “with science in the selection” – looking at where the brand can be boosted, where thought leadership can be leveraged and getting to meet people you wouldn’t ordinarily meet. This approach, combined with educating the board about what their role is in this process, is where the real credibility lies, being able to draw a direct line between the marketing plan and business plan. Whilst David feels fortunate that Adobe isn’t faced with a marketing credibility gap, given the progress of its brand in recent years, he reflected the group’s thoughts in terms of the importance of “aligning marketing to the business strategy” – having the ability to clearly link the strategy and current marketing activities. For David, this goes hand-in-hand with being “radically transparent” with the business about where you sit and how you perform against the metrics, once you have determined how success will be measured. The challenge comes in ensuring you have that element of self-awareness; “do you really know your industry? Do you know your market? Because if you do, you will have de facto credibility.” To that point, Scott added that “it’s about getting into the playing field,” ensuring that you and your marketing team are looking at the quarterly business reviews, understanding how the sales team is incentivised, how your own business operates, and what customers really care about and help enable modern selling within your sales teams. Whilst marketers always need to be reminded to know your customer (KYC), for Christoph, “as much as we are talking about KYC, it’s also about KYI – know your industry.” Though it may be easy to go with market trends, in fact, Christoph advocates looking at what the market does, then doing something different. Deutsche Bank launched Flow, its customer magazine in digital and print, at a time where print magazines were starting to be forgotten, in order to engage with the customer, offer product neutral market insights, and to showcase client success stories. This approach was echoed by Scott, who challenges his team to regularly attend customer meetings; “you have to know your customers, you have to know your competition, and you have to know your company as well.” By embedding yourself in what your customers are doing, you become more credible, which enables your sales teams to sell better, and ultimately makes you more relevant to those non-marketing stakeholders. From a B2B go-to-market perspective, Tony relayed that across the clients that EI works with, the marketers who really earn the respect of their boards can narrate at a very granular level the reasons why they need to spend externally in certain markets. These marketers have truly understood their firms’ weaknesses in terms of focused brand position, thought leadership relevance and the ability to meet the right people face-to-face in each relevant market, where strong, proprietary activity and market-defending external activities are sound. Where this is weak, especially in markets that are a high priority on the firm’s business plan, this is the priority area for external marketing activity investment. CMOs who start with this understanding of why, and then pro-actively scour the market for the right marketing activities, applying “rigour and pro-activity in selection” rather than being at the mercy of incoming sales calls, or repeating activity “because they have always done it,” are the CMOs who rapidly earn credibility across the business. The panel agreed on ensuring that the business-critical attributes of the team must be in-house – from extraordinary ability to write content, to being agile yet focussed in your approach. For example, in Scott’s view, “hiring part-scientists, part-creatives” is where the focus has been in terms of hiring into his team. For Cara, the importance lies in spending time ensuring that people fit culturally, both as an employee or an agency; she finds the “most value is with smaller niche agencies,” and bringing these agencies into the business and “allowing them to be an extension of your existing team.” This raised an interesting question for the panel with a general suggestion that perhaps it is time to move away from generalist, end-to-end agencies, and rather, work strategically on longer programmes with specialist providers. 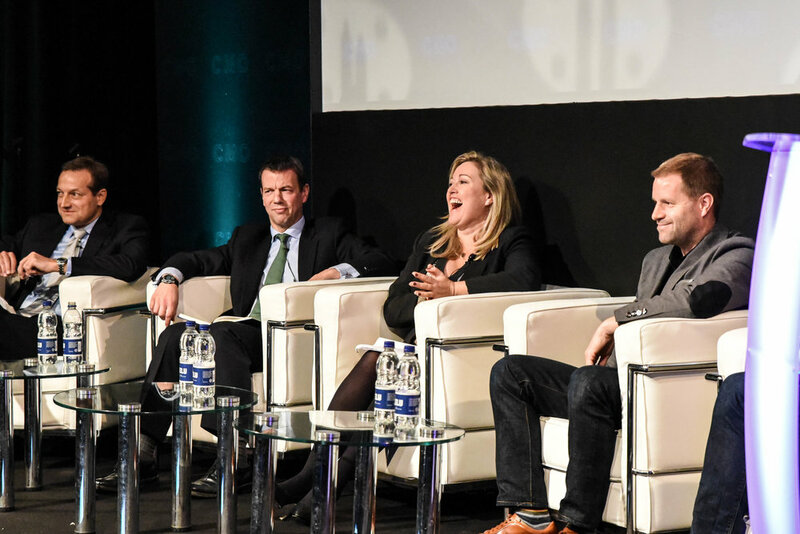 Tony was delighted to be able to participate in this panel alongside these leading marketers, and EI Advisory is looking forward to next year for the second iteration of the Forbes CMO Summit Europe.